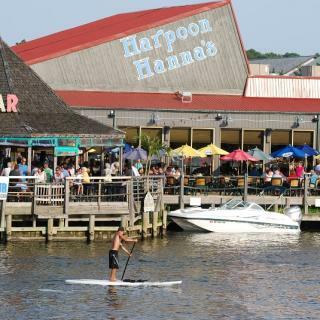 Come to Fenwick Island Delaware to enjoy a beautiful bay-front dining experience at Harpoon Hanna's. Harpoon Hanna's offers lunch and dinner 365 days a year. Watch the next big game in our sports bar on one of our 15 televisions or enjoy a relaxing evening outside at our tiki bar. Harpoon Hanna's also offers free boat docking for all customers.